is an ancient practice of physical and spiritual development. It is a systematic method to study, practice, teach, and adapt yoga. This vinyasa krama (movement and sequence methodology) approach to yogasana (yoga posture) practice is unique in all of yoga. By integrating the functions of mind, body, and breath in the same time frame, a practitioner will experience the real joy of yoga practice. Each of the important postures (asanas) is practiced with many elaborate vinyasas (variations and movements). Each variation is linked to the next one by a succession of specific transitional movements, synchronized with the breath. The mind closely follows the slow, smooth, deliberate ujjayi yogic breathing; and the yoking of mind and body takes place with the breath acting as the harness. you will flow through a fun vinyasa style practice using creative and Intelligent sequences based in Vinyasa Krama, deep breathing and props, will incorporate both traditional and non-traditional yoga movements to strengthen your body within different ranges of motion. Core strengthening and balancing will be central to the active portion of the class. Ashtanga Yoga is an ancient system of Yoga that was taught by Vamana Rishi in the Yoga Korunta. This text was imparted to Sri T. Krishnamacharya in the early 1900’s by his Guru Rama Mohan Brahmachari, and was later passed down to Pattabhi Jois during the duration of his studies with Krishnamacharya, beginning in 1927. This method of Fixed Sequence yoga involves synchronizing the breath with a progressive series of postures—a process producing intense internal heat and a purifying sweat that detoxifies muscles and organs. ​Iyengar Yoga is a form of Hatha yoga in which there is a focus on the structural alignment of the physical body through the development of asanas. Through the practice of a system of Asana, it aims to unite the body, mind and spirit for health and well-being. The discipline is considered by its practitioners to be a powerful tool to relieve the stresses of modern-day life, in turn helping to promote total physical and spiritual well-being. Iyengar Yoga is characterized by great attention to detail and precise focus on body Alignment Iyengar pioneered the use of "props" such as cushions, benches, blocks, straps and sand bags, which function as aids allowing beginners to experience asanas more easily and fully than might otherwise be possible without several years of practice. Props also allow elderly, injured, tired or ill students to enjoy the benefits of many asanas via fully "supported" methods requiring less muscular effort. ​is a type of therapy that uses yoga postures, breathing exercises, meditation, and guided imagery to improve mental and physical health. 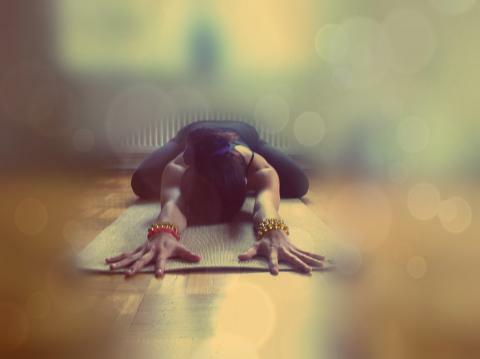 The holistic focus of yoga therapy encourages the integration of mind, body, and spirit. Modern yoga therapy covers a broad range of therapeutic modalities, incorporating elements from both physical therapy and psychotherapy. Yoga therapy is practiced in a wide range of formats. Yoga therapy practice can resemble physical therapy, rehabilitative therapy, and/or psychotherapy. Unlike a standard yoga class, yoga therapy sessions are typically conducted in one-on-one or small group settings. Yoga therapy can be provided as an adjunct therapy to complement other forms of treatment, or it can be used to directly treat a specific issue. Yoga techniques range from simple to advanced, and can be enjoyed by people of all ages. Potential benefits from yoga therapy include stress reduction, psychological well-being, improved diet, and efficient functioning of bodily systems. is a quiet and simple practice, but not necessarily an easy practice. Yin yoga works deeply into our body.It targets our deepest tissues of the body, our connective tissues — ligaments, joints, bones, and the deep fascia networks of the body — rather than the muscles. Energetically, yin yoga improves the energy flow, enhancing the flow of chi in the organs. To be healthy, we need healthy organs as well as healthy muscles. 3) Hold the position: beginners hold for 1-3 minutes, advanced hold for five minutes or more. stamina, strength, and flexibility, as well as stress reduction. Power Yoga is a well rounded flowing asana practice integrating mental practices that enhance everyday living. The class is intended to invigorate your body and help you practice developing a calm, less reactive state of mind with dynamic flowing routines. is the formal practice of controlling the breath, which is the source of our prana, or vital life force. Here, read up on pranayama exercises & poses, breathing techniques and sequences. On a physical level by using pranayama techniques we can utilise and strengthen the whole range of our respiratory organs. We explore the lower, middle and upper parts of the breath and regulate the inhalation, retention and exhalation of the breath. A regular pranayama practice can stimulate the parasympathetic system, countering the overstimulation our bodies go through during the Fight or Flight response. is also known as Yogic Sleep. It is a state of conscious Deep Sleep. In Meditation, you remain in the Waking state of consciousness, and gently focus the mind, while allowing thought patterns, emotions, sensations, and images to arise and go on. However, in Yoga Nidra, you leave the Waking state, go past the Dreaming state, and go to Deep Sleep, yet remain awake. While Yoga Nidra is a state that is very relaxing, it is also used by Yogis to purify the Samskaras, the deep impressions that are the driving force behind Karma. for thousands of years by the sages and yogis. Of the three states of consciousness of Waking, Dreaming and Deep Sleep, as expounded in the Upanishads, particularly the Mandukya Upanishad, Yoga Nidra refers to the conscious awareness of the Deep Sleep state, referred to as prajna in Mandukya Upanishad. This is the third of the four levels of consciousness of AUM mantra, relating to the state represented by the M of AUM. The four states are Waking, Dreaming, sleep, and turiya, the fourth state. The state of Yoga Nidra, conscious Deep Sleep, is beyond or subtler than the imagery and mental process of the Waking and Dreaming states. As a state of conscious Deep Sleep, Yoga Nidra is a universal principle, and is not the exclusive domain of any more recent teachers or traditions. Yoga Nidra brings an incredible calmness, quietness and clarity. Yoga Nidra is one of the deepest of all meditations, leading awareness through many levels of mental process to a state of supreme stillness and insight. The descriptions in the article below can be difficult to understand. With patient and thorough reading, the understanding is well worth the effort, allowing you to see the profound depth of Yoga Nidra, which is far beyond just relaxation. It is said that a picture is worth a thousand words. Sometimes it takes thousands of words to get the inner "aha" of the meaning. Most important of all, it is the persistent practice that brings the real joy of the practice of Yoga Nidra, as with all useful practices in life and Yoga. Hot Stone therapy is technically termed as Geothermotherapy that is the use of heated stones and chilled stones to affect a chemical release within the human body. The placing of the stones is followed by a holistic massage, which results in a deeper and more intense treatment. This is because as the heat penetrates the body it relaxes the muscles. Deep relaxation, the warmth relaxes both physically and mentally. The heat from the stones is transferred to the body by conduction and it can reach up to 3 - 4 cm into the muscle. Circulation is improved and muscles have an increased blood supply, improving function. Toxins and waste are eliminated more quickly. The warmth can relieve pain in muscles and joints. Tension in connective tissue is released. The direct heat that hot stone therapy provides, relaxes muscles allowing manipulation of a greater intensity than with regular massage. A Hot Stone therapy massage expands the blood vessels and pushes blood and unwanted waste materials through the body. It is said that one massage stroke delivered by a Hot Stone therapist whilst using the stones, is actually as powerful as ten normal massage strokes. The effects are thought to last ten times longer than a conventional holistic massage. Hot Stones Therapy & Massage is suitable and beneficial for everybody, whatever the age! Mmmm, heat feels so good! Float and Fly Start getting upside down! Finding Float will help you build the confidence and body awareness to start exploring the world from a new perspective. Flows and workshop sections geared toward introducing arm balances, headstand, forearm stand, and handstands. This package is ideal for those looking to just start their inversion journey! ​​Progress your inversion journey! Erin & Steph provide over 5 hours of content that includes detailed warm-ups, helpful sequences to practice new skills, intricate workshop sections to grow your practice, and of course, related cool down and restorative work. Learn how to harness deep core activation and start exploring different inversion variations while working toward pressing. This package is ideal for those with a regular yoga practice and some knowledge of inversions. Classes are organized by inversion type (arm balance, headstand, forearm stand, handstand wall, handstand free standing), and can be done in the provided sequence or any order of your choosing. 1. Core Foundations: Learn the basics of tuning in and integrating core activity into the entirety of your practice. Solidify your foundation, while exploring essential warm ups and alignment cues. Practice your new skills in the workshop section with crow pose or Bakasana. 3. Forearm Stand: Open the shoulders and fire up the legs through a fun and funky flow that will get you standing on your forearms in no time! Experiment with different arm positioning and strength building drills that will help you find your float in the workshop section. 4. Handstand Wall & Prop: Explore the importance of prop usage for inversions. Learn to take away a great deal of guesswork with “no jump” handstand tutorials, and a variety of prep poses to help you gain confidence on your hands. 5. Freestanding Handstand: Start building confidence to practice handstand in the middle of the room with a variety of activated and controlled freestanding drills. Explore full body activation even further, and learn to PLUG IN to float up. Interested in beginning an inversion journey, but not quite sure where to start? These classes/sessions focuses on teaching you the basics of headstand, forearm stand, and handstand through essential warm ups and strengtheners, a fun flow section where you can practice integrative movements, and a workshop portion where we take the time to break down specific drills to get you upside down! This package is ideal for those looking to just start their inversion journey! Level 1 Basic Yoga Thai Flow. Yoga Thai Partner Sessions. You will learn a 1 and half Hour Yoga Thai Flow.